My color affection shawl is finally done!!! The modifications I made were to knit it with sport weight yarn on size US 7 needles, to do a YO before each RS row in the second and third sections that I later dropped when I came back to it (this prevented a tight edge), and I think I did more short rows than required since the pattern only says to do 9 more sets but doesn’t really mention whether all of the stitches should be worked so I just kept going until nearly all of them were done. 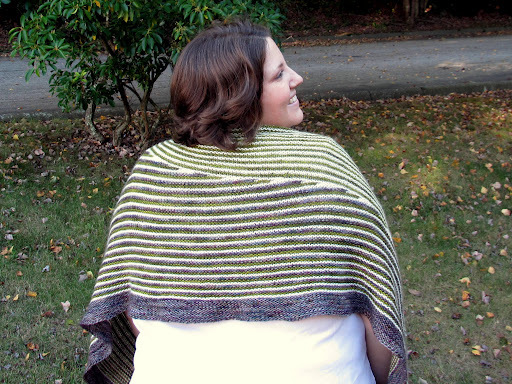 4.5 months is actually crazy good turnaround time for me for finishing a shawl, especially one this large. Its final dimensions were 91″ wide along top edge and about 21″ deep. Honestly, this thing is gigantic. 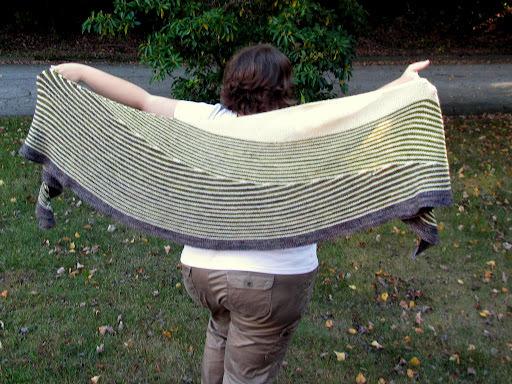 It’s almost more of an extremely long/wide scarf or stole than it is a shawl, but whatever you want to call it, it’s pretty unique. 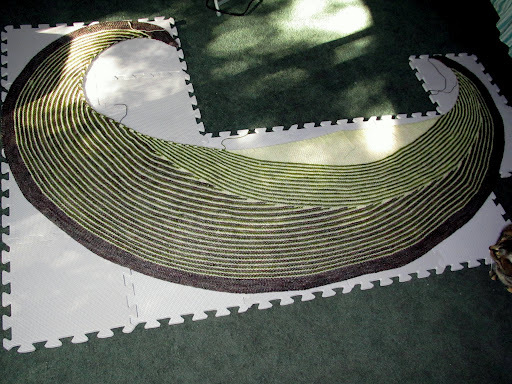 I just laid it flat to dry for blocking, I didn’t try to pin it out anywhere. It took nearly all of 3 skeins of yarn. I used The Sanguine Gryphon Bugga undyed for the MC, Common Emerald Moth for CC1, and Fierce Snake for CC2. I dig this color combo so much. I actually have another skein of the CC1 and CC2 colorways so I will probably make coordinating colorwork mitts or a hat at some point. We’ve got the classic over the shoulders look, the newly-invented waving madly like it’s a magical voodoo cape pose, the elegantly draped across the front and over one shoulder method, or the funky scarf-style… how to choose? All told, I enjoyed this pattern and it goes more quickly than expected, but I am certainly glad it’s finished. 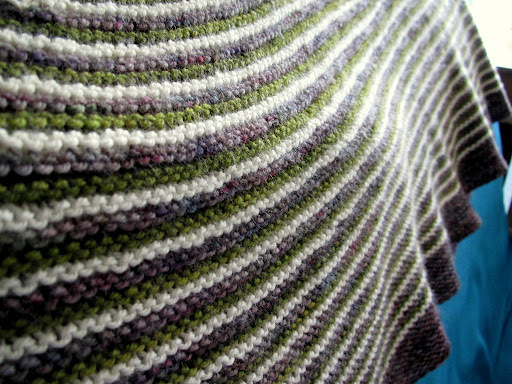 Those edging rows had over 400 stitches in them and took me about 30 minutes to knit each one. But damn, I do love finishing things! Bring on the next WIP, woohoo! 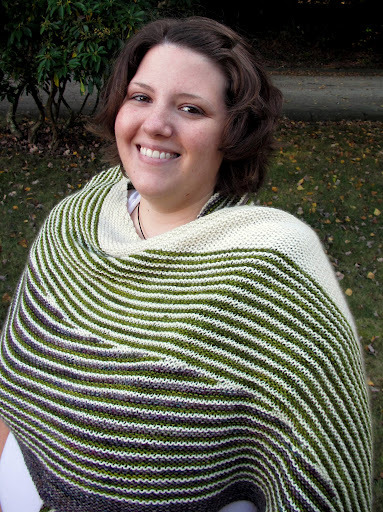 This entry was posted in Bugga, FO, shawls by shoelaceswitcher. Bookmark the permalink. Congrats! Beautiful work! woohoo indeed! Oh just look at you! The joy at finally finishing that project definitely shows. I actually had no idea it was that big, in the photos it always looked more shawlette sized. It is even more gorgeous than I imagined! But then again, you know how much I love this project. Congrats! Congratulations, love the colors! And it looks great on you any way you wear it. I keep meaning to make an Affection of my own, but I just can't commit to the colors, as if I would never be allowed to make it twice! haha things did get a bit silly, thanks! It is quite large. Thank you! I swatched a bit before I chose my favorite combo, it really helped. I think that's the reason why so many people have knit it twice! That color combination is great! And I'm all for the scarf styling. Maybe I'll have to make myself one. 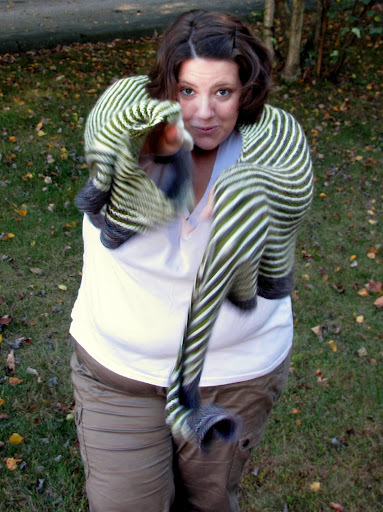 I gave away a bunch of shawls because I had no idea how to wear them. Beautiful! Love it! You finished first- I still have another inch of the border to go- seeing yours finished is sooooooo inspiring. 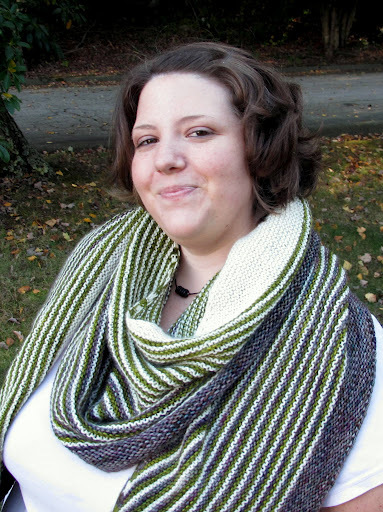 I've come to really love shawls, but the scarf style is a bit more “hip”. Oh my gosh, I can't believe you're halfway through the edging already!! Super speedy! Can't wait to see yours. Simply amazing and stunning! I am in aww of your patience with this project. It's just lovely!